On this page, we’ll take a look at other football-themed online casino games that are unique enough to deserve mention. 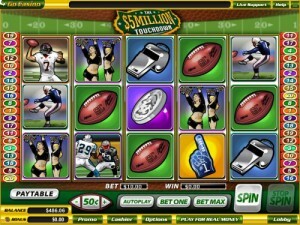 This online slots game, by Vegas Technology, celebrates the sport in two major ways: first off, this game is just as addictively fun as the actual game is and secondly, they don’t call it The $5 Million Dollar Touchdown for nothin’ – players stand a chance of winning $5 million is all the stars (and reels) align. Game symbols include Football Players, Cheerleaders, Whistle, Dollar, Goal and a Foam Finger. The Referee symbol is the game’s wild symbol, the Logo symbol is the game’s scatter symbol and the Target symbol serves as the game’s Bonus Game symbol. You can play $5 Million Dollar Touchdown at Vegas-tech-powered online casinos that accept US players, such as Crazy Slots. When three or more scatter symbols appear, you’ll win up to 15 free spins. When at least two target symbols appear on the reels, a bonus round is activated, where you’re thrown a ball, and have to catch it. Once you fumble and drop the ball, the bonus game ends. Any wins collected during the bonus game round are multiplied by the number of paylines crossing through. 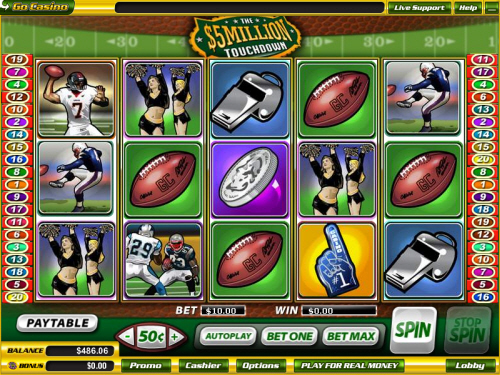 This 5-reel, 20 payline online slot game is by Rival, and it too pays tribute to the sport of football. Game symbols include The Gridiron, Gator Mascots, Football Players, Cheerleader, Referee, Stadium, Refreshments and Football Field. The game’s wild symbol is the Cheerleader. 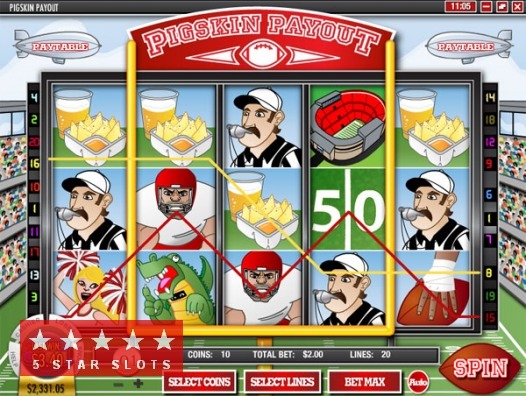 The game’s scatter is the Stadium symbol – if you land three or more of these, you’ll win up to 25 free spins. As for these games, some of them are very entertaining while some are only nominally entertaining. They could all use a little work to be honest but they also all have their selling points. It can be very fun to sit around and spend some time playing one of these bad boys. If you ever have the chance I do highly recommend it to anyone. The problem is that you want them all to be a bit more like the others. If they were all to get together and have one highly entertaining love child it would be just fine by me. I would just adore the little fellow like no other. I would spend all of my spare time playing with it and giving it the attention it deserved. Now that you know a bit more about my mentality if you want to go I wouldn’t blame you but staying here could be fun too. Some people tell me I have spent entirely too much time with my games but I would have to beg to differ. I think that I have spent just the right amount of time with them and they are just getting broken in the right way.